My job was to shovel snow. My memories of Christmas’s past are filled with the gluttony of sugar-filled food. Back in the “old” days the traditional role of decorating, cooking and purchasing presents, requiring hours of labor, went to the women. My job was to shovel snow and come inside the warm house at the right moment to lick the cookie, cake or pie bowls, spoons and beaters. There was no worry about gaining weight since the snow was never-ending and thus so was my shoveling. My mother, in her day, and her mother, Ada, in her time, made a lot of cookies at Christmas. 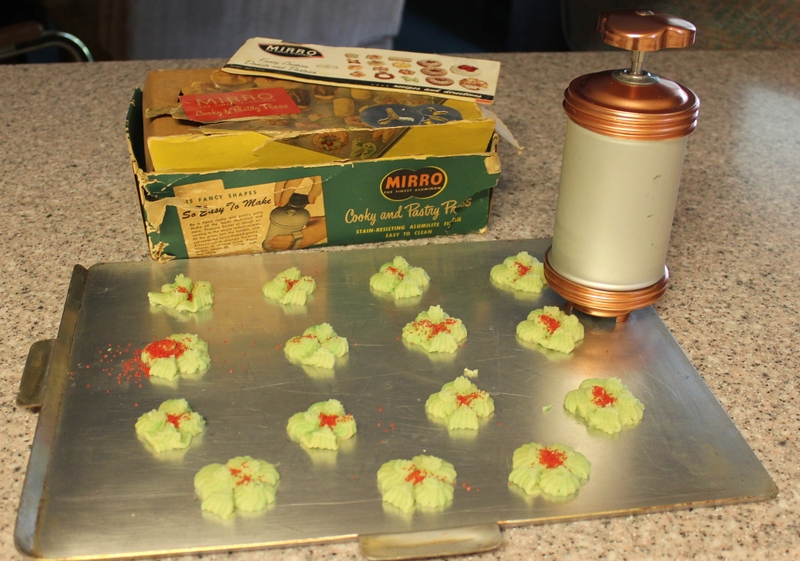 At some point Mom tired of the labor involved in making Spritz cookies and gave me her steel Mirro Cookie Press, which I have used for many years. 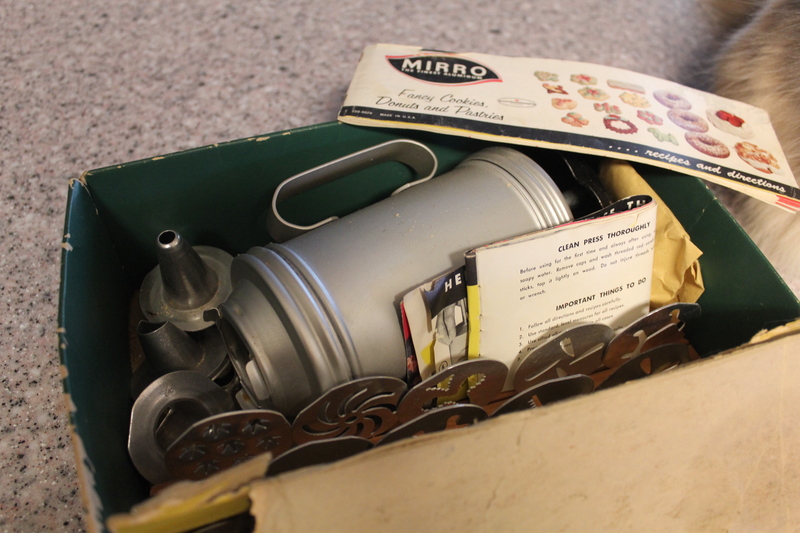 When Grandma passed on I also inherited her still-in-the-box Mirro Cookie press, plus all Mom and Grandma’s metal cookie cutters. These things are all treasures that I hold onto, even if not used every year. There’s no doubt about it, the steel Mirro cookie press is hard to operate. You have to use the right amount of shortening and butter in the recipes to ensure that the dough slides down the barrel, through the removable patterned plates. The plunger on the Mirro Cookie Press requires a hard twist to push the dough. It’s a workout. There are now plastic cookie presses that are ergonomically designed and easy to use. But I refuse to buy one, preferring to use my arm muscles like my mom and her mom, before the words “ergonomically designed” became a word to mean “no muscle power needed”. As a side note I wonder how many recipes now require shortening? Heck, I even have an old Pfferneuse cookie recipe that lists lard as the ingredient. But they are very tasty, even if they are sinful. My Grandma Ada always had ribbon candy on display in her apartment, as well as Christmas themed hard candy. She was very frugal but she always found the money for her favorite ribbon candy at Christmas. Is it still possible to get ribbon candy? I Googled it and it looks like Walmart sells it but I’d rather go to the Cracker Barrel or even better, order it from the Vermont Country Store. Grandma’s hard candy was put into several glass decorative containers and displayed for company. Several eyes made sure I didn’t eat all the hard candy. Grandma also made fruitcake. I found one of her recipes with a note that it was my Dad’s favorite. Now fruitcakes are a joke, used for doorstops, but I’m sure Grandma’s, made with love and fresh ingredients, was delicious. Christmas for me, when I was young, meant snow, snow and more snow. It meant Dad being overbearing, giving orders, forcing me to go to church services. Christmas Eve meant either Mom or I or both would be in tears. It was not a happy season. But it seemed Mom, always the diplomat, loved to decorate the house, loved to cook and loved to sing Christmas carols while working. 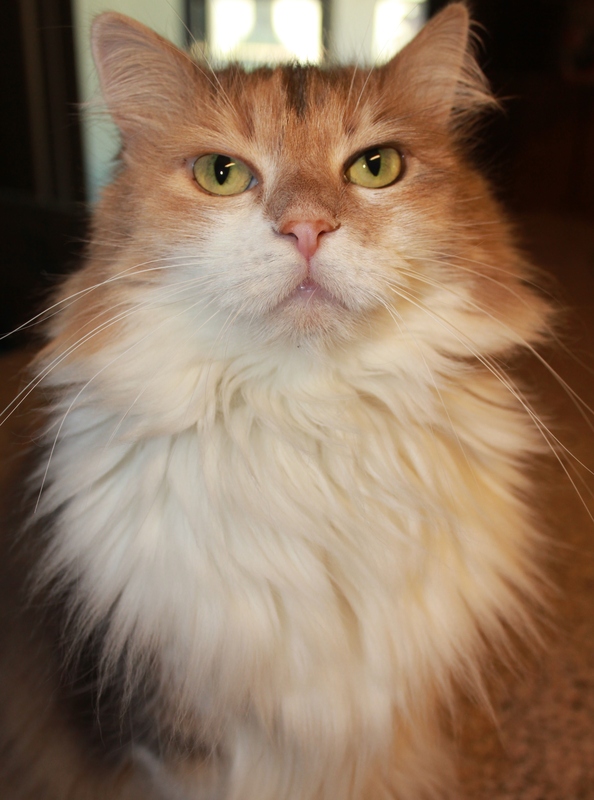 She tried so hard to make the season a time of peace in our house but it was usually the opposite. Over the years I’ve dropped any desire to celebrate Christmas. I don’t decorate the house for the season. I’m a Christian, there’s no denying that. But Christmas has lost its starry-eyed, nostalgic, traditional feeling. It is no longer about the reason for the season, the birth of baby Jesus. It’s become commercial, starting with store displays in July and months of TV ads. Now it isn’t politically correct to even say Merry Christmas, so of course I say it over and over and fellow rebels (literally, here in the south), say it back to me as we smile and wink. How come “I” don’t get a Christmas tree? ?